"He's being seen as some kind of sensation because he's just 18 years old and playing for Borussia Dortmund." Jadon Sancho's success in the Bundesliga should not come as a surprise, according to former Arsenal and Bayern Munich coach Andries Jonker. The Dutch coach believes the 18-year-old, who is back in England on international duty, is merely confirming the talent that everyone knew he had at Borussia Dortmund. 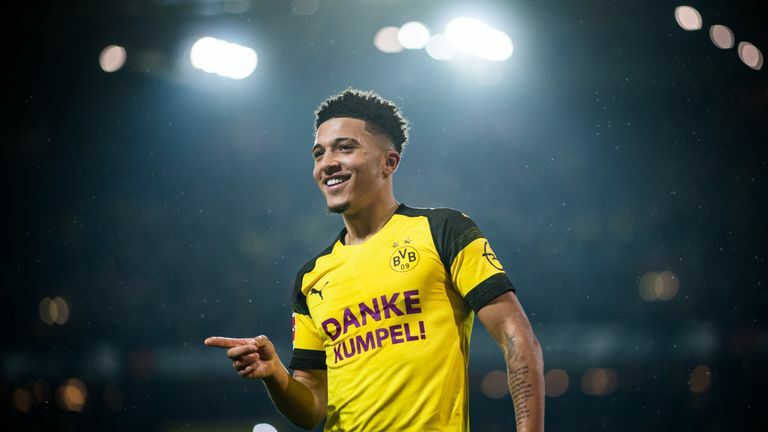 Sancho currently tops the Bundesliga assist charts with 15 and has chipped in with eight goals in a fine season abroad. "He's a huge talent, everybody knew that," said Jonker, whose most recent managerial job was with Wolfsburg. "In Germany he is confirming his huge talent, it's no surprise, you knew it. "He needed that time to practise, to get the level, the power the strength and to handle the situation. "He's being seen as some kind of sensation because he's just 18 years old and playing for Borussia Dortmund. "Bayern Munich are interested, which is a huge thing. Just 18 years old and that good." Jonker suggested that young English players are seeking opportunities abroad because of the difficulty in breaking into first teams at home. Chelsea's Callum Hudson-Odoi, who was also picked in Gareth Southgate's squad for the upcoming European Qualifiers, has been the subject of offers from Bayern Munich, while Reiss Nelson has been impressing at Hoffenheim, on loan from Arsenal. Jonker worked with the 19-year-old at Arsenal and believes he too has the potential to reach the top of the men's game. England's future prospects look bright, but in Germany there are few players coming through of Sancho and Nelson's ilk, according to Jonker. "Sometimes you have tremendous talents, sometimes you don't," said Jonker. "German teams are looking for quick, creative, individual players and they find them in England. "But don't worry about the Germans, the Germans always come back."